The West Siberian Plain is located east of the Ural Mountains mostly in the territory of Russia. It has been described as the world's largest unbroken lowland—more than 50 percent is less than 100 metres (330 ft) above sea level—and covers an area of about 2.6–2.7 million square kilometres (1.0 million square miles) which is about one third of Siberia, extending from north to south for 2,400 km (1,490 mi), from the Arctic Ocean to the foothills of the Altay Mountains, and from east to west for 1,900 km (1,180 mi) from the Ural Mountains to the Yenisei River. The plain has eight distinct vegetation regions: tundra, forest-tundra, northern taiga, middle taiga, southern taiga, sub-taiga forest, forest-steppe, and steppe. The number of animal species in the West Siberian Plain ranges from at least 107 in the tundra to 278 or more in the forest-steppe region. The long Yenisei river flows broadly south to north, a distance of 3,530 km (2,195 mi) to the Arctic Ocean, where it discharges more than 20 million litres (5 million gallons) of water per second at its mouth. Together with its tributary Angara, the two rivers flow 5,530 km (3,435 mi). The valley formed by the Yenisei acts as a rough dividing line between the West Siberian Plain and the Central Siberian Plateau. Glacial deposits extend as far south as the Ob-Irtysh confluence, forming occasional low hills and ridges, but otherwise the plain is exceedingly flat and featureless. The West Siberian Plain consists mostly of Cenozoic alluvial deposits and is extraordinarily flat. A rise of fifty metres in sea level would cause all land between the Arctic Ocean and Novosibirsk to be inundated (see also Turgai Straits, West Siberian Glacial Lake). It is a region of the Earth’s crust that has undergone prolonged subsidence and is composed of horizontal deposits from as much as 65,000,000 years ago. Many of the deposits on this plain result from ice dams that reversed the flow of the Ob and Yenisei rivers, redirecting them into the Caspian Sea, and perhaps the Aral Sea as well. It is very swampy and soils are mostly peaty Histosols and, in the treeless northern part, Histels. This is one of the world's largest areas of peatlands, which are characterized by raised bogs. It is believed that Vasyugan Swamp is the world’s largest single raised bog, covering approximately 51,600 square kilometres (19,900 sq mi). In the south of the plain, where permafrost is largely absent, rich grasslands that are an extension of the Kazakh Steppe formed the original vegetation, which has almost all been cleared as of the early 21st century. 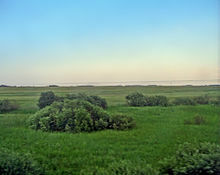 Large regions of the plains are flooded in the spring, and marshlands make much of the area unsuitable for agriculture. The principal rivers in the West Siberian Plain are from west to east the Irtysh, Ob, Nadym, Pur, Taz and Yenisei. There are many lakes and swamps. This area had large petroleum and natural gas reserves. Most of Russia’s oil and gas production was extracted from this area during the 1970s and 80s. ^ "Russia". Encyclopædia Britannica. Retrieved 2006-10-24. ^ a b "Western Siberian Plain". Columbia Encyclopedia. Retrieved 2006-10-24. The West Siberian broadleaf and mixed forests ecoregion is a thin band of mixed forest along the southernmost edge of the taiga in Western Siberia, just north of the forest-steppe region and south of the West Siberian taiga. The biodiversity of the zone is the highest in Siberia, due to its transitional position between many different ecoregions. The area acts as a long corridor for migration of animals along the east-west axis. The ecoregion is in the Palearctic ecozone, with a Humid Continental climate. It covers 223,516 km2 (86,300 sq mi).